The standards provide the foundation for visual art education for all students. The standards support student-learning outcomes through big ideas – enduring understandings and essential questions. The concepts embedded in the standards reflect the scope of learning – the knowledge, skills, and understandings – taught through study of the visual arts. By including all aspects of creating, presenting, responding, and connecting in study of the visual arts, student learning through these standards explores the full scope of what it means to be an artistically literate citizen. While presented chronologically the processes are best designed and taught in a blended fashion to support rich artistic skills and behaviors. The standards provide ways to address the content of visual art education within the school year. There are 15 Enduring Understandings with 15 correlated grade-by-grade (preK-8 and three levels for high school) Performance Standards. Art educators will be able to cluster group standards using more than one within a given instructional unit. The Performance Standards offer a practical system for teachers to use to inform their instruction. The standards emphasize deep learning in the visual arts creating higher expectations and support college, career and citizenship readiness for all students. The performance standards offer learning progressions for students. Embedded in the standards are ideas about how arts learning can be broadened and deepened to support students in making meaning of their lives and their world. Essential questions are provided for teachers as thought starters promoting inquiry based teaching and learning. They support communicating and learning in art by providing language needed for students and stakeholders alike. The standards provide opportunities for educators to reflect on their practice. The visual arts performance standards are fundamentally grounded in collective beliefs about what constitutes effective teaching and learning. Individual educators are encouraged to review and use the standards in achieving the goal of continuous improvement. Essential Question(s): What conditions, attitudes, and behaviors support creativity and innovative thinking? What factors prevent or encourage people to take creative risks? How does collaboration expand the creative process? Essential Question(s): How does knowing the contexts histories, and traditions of art forms help us create works of art and design? Why do artists follow or break from established traditions? How do artists determine what resources and criteria are needed to formulate artistic investigations? Essential Question(s): How do artists work? How do artists and designers determine whether a particular direction in their work is effective? How do artists and designers learn from trial and error? Essential Question(s): How do artists and designers care for and maintain materials, tools, and equipment? Why is it important for safety and health to understand and follow correct procedures in handling materials, tools, and equipment? What responsibilities come with the freedom to create? Essential Question(s): How do objects, places, and design shape lives and communities? How do artists and designers determine goals for designing or redesigning objects, places, or systems? How do artists and designers create works of art or design that effectively communicate? 2.3P: Collaboratively develop a proposal for an installation, artwork, or space design that transforms the perception and experience of a particular place. 2.3Ac: Redesign an object, system, place, or design in response to contemporary issues. Essential Question(s): What role does persistence play in revising, refining, and developing work? How do artists grow and become accomplished in art forms? How does collaboratively reflecting on a work help us experience it more completely? Essential Question(s): How are artworks cared for and by whom? What criteria, methods, and processes are used to select work for preservation or presentation? Why do people value objects, artifacts, and artworks, and select them for presentation? 4.2Ac: Analyze, select, and critique personal artwork for a collection or portfolio presentation. Essential Question(s): What methods and processes are considered when preparing artwork for presentation or preservation? How does refining artwork affect its meaning to the viewer? What criteria are considered when selecting work for presentation, a portfolio, or a collection? 5.1P: Analyze and evaluate the reasons and ways an exhibition is presented. 5.1Ad: Investigate, compare, and contrast methods for preserving and protecting art. Essential Question(s): What is an art museum? How does the presenting and sharing of objects, artifacts, and artworks influence and shape ideas, beliefs, and experiences? How do objects, artifacts, and artworks collected, preserved, or presented, cultivate appreciation and understanding? Essential Question(s): How do life experiences influence the way you relate to art? How does learning about art impact how we perceive the world? What can we learn from our responses to art? Essential Question(s): What is an image? Where and how do we encounter images in our world? How do images influence our views of the world? 7.2P: Analyze how one’s understanding of the world is affected by experiencing visual imagery. Essential Question(s): What is the value of engaging in the process of art criticism? How can the viewer “read” a work of art as text? How does knowing and using visual art vocabularies help us understand and interpret works of art? 8.1P: Interpret an artwork or collection of works, supported by relevant and sufficient evidence found in the work and its various contexts. Essential Question(s): How does one determine criteria to evaluate a work of art? How and why might criteria vary? How is a personal preference different from an evaluation? 9.1P: Establish relevant criteria in order to evaluate a work of art or collection of works. Essential Question(s): How does engaging in creating art enrich people’s lives? How does making art attune people to their surroundings? How do people contribute to awareness and understanding of their lives and the lives of their communities through art-making? 10.1Ad: Synthesize knowledge of social, cultural, historical, and personal life with art-making approaches to create meaningful works of art or design. Essential Question(s): How does art help us understand the lives of people of different times, places, and cultures? How is art used to impact the views of a society? How does art preserve aspects of life? 11.1P: Document the process of developing ideas from early stages to fully elaborated ideas. 11.1Ac: Utilize inquiry methods of observation, research, and experimentation to explore unfamiliar subjects through art-making. 11.1Ad: Synthesize knowledge of social, cultural, historical, and personal life with art-making approaches to create meaningful works of art or design. 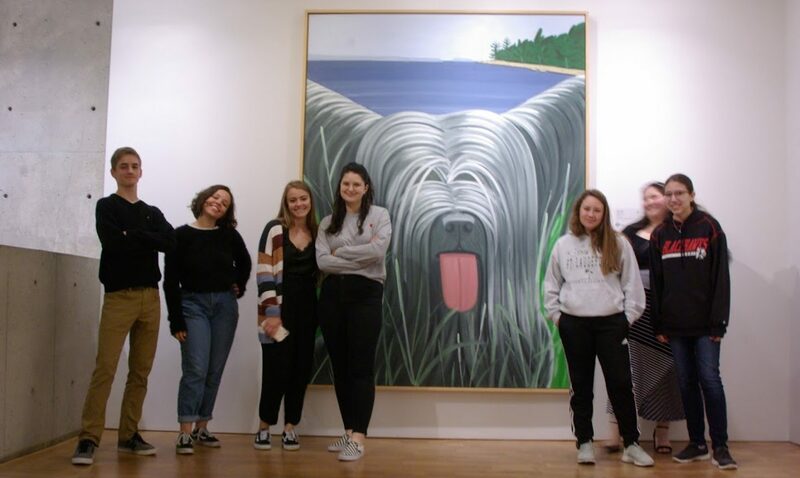 Pingback: Day to Day in the Visual Arts with Frank Korb | Are You Setting Goals for the Remainder of Your Summer or the Beginning of the School Year? I am!